Train like world-class Olympic, professional, and collegiate athletes by supercharging your recovery with the Rapid Reboot recovery system! The system, which utilizes dynamic, sequential air compression, is based on important medical technology and principles proven to improve circulation, mobilize metabolites and other toxins like carbon dioxide from muscle tissue, flush out lactic acid, mitigate edema, reduce exercise-induced swelling, alleviate inflammation, and facilitate protein synthesis by increasing blood flow to muscles. In short, this speeds up your body's natural process of healing, allowing you to recovery quickly and consistently. The boots have other applications outside of sports medicine, including rehabilitation from injuries or surgery and treating lymphedema, poor circulation, tension, cramps, restless legs, varicose veins, sciatic nerve pain, and general venous insufficiencies. Control pump (10 in x 6.5 in x 5 in) operates on 110-120V, 60Hz (U.S., Canada, and Mexico) with a power use of 30W. 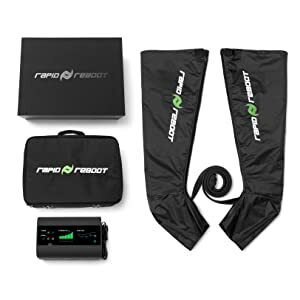 After much research and testing across several alternatives (including Normatec), I purchased the Rapid Reboot Recovery System. After 2 weeks of use, I am happy to report that it is the best recovery product I have EVER used. Training for Spartan Races and Crossfit, my legs are constantly placed under significant training load. The Rapid Reboot System has allowed me to significant enhance (and shrink time required) for my recovery. The boots flush my legs of all lactate buildup and after 20 minutes (30 following really long workouts) my legs feel as though I could hop right back on my bike or pull on my running shoes. Compared to other alternatives, I really appreciate the increased compression available with the Rapid Reboot System. In conjunction with a reasonable price point these boots are (in my opinion) the best option on the market. If you are between sizes, go by your inseam. Some tall people have longer torsos and shorter legs in which case they would fit better in a shorter size. On the other hand, some shorter people have longer legs than torso in which case they would fit better in the longer size. When in doubt, we recommend people go with the size longer. The boots are bladders covered in a stitched material. They have a zipper that runs down the middle of the boot with a second zipper for people with larger legs. I don't know who would use the larger size because they would have to have enormous legs though. The setup and use are very simple. It has 2 different modes, adjustable pressure and you can turn on/off different compartments. It comes with a nice travel case. Overall we've been very impressed with the quality. It comes with a 1 year warranty but the website says that they will help you out even if the warranty has expired. We have 2 people that have been using them almost daily for 3 weeks so we can't comment on the long term durability. Now for the normatec vs Rapid Reboot comparison. The quality of the two seems to be the exact same. I don't think that one is better than the other in that category. The rapid reboot can go to a higher pressure than normatec. I doubt many people would be able to go to the highest pressure but it's available if you want it. Ease of use is the same also. A win for normatec is the size of the control. The Rapid Reboot puts the control on top of the pump box which is similar to the old model of normatec. The new normatecs have a smaller control that can be held in our hand while using the device but I'm not sure why you would need it. Once I started it I just let it do it's thing until it's done. The biggest difference was the price. Normatec retails for $500 more than Rapid Reboot. I wasn't even able to find a pair of used older model normatec's for cheaper than I was able get the Rapid Reboots (obviously that could vary from what someone finds). Overall I recommend the Rapid Reboots. They work really well and are cheaper than comparable options. Finally, although not a buying consideration for many people, I also find the staff at Rapid Reboot to be extremely friendly, accommodating, and customer focused. As compared to being "just another number" like with other companies, I firmly believe my best interest is what matters to the team at Rapid Reboot.